Tramale Forbes (wearing the black vest) and the crew in for cuts at Cato’s Cut Masters. They don’t like rust on their rims. 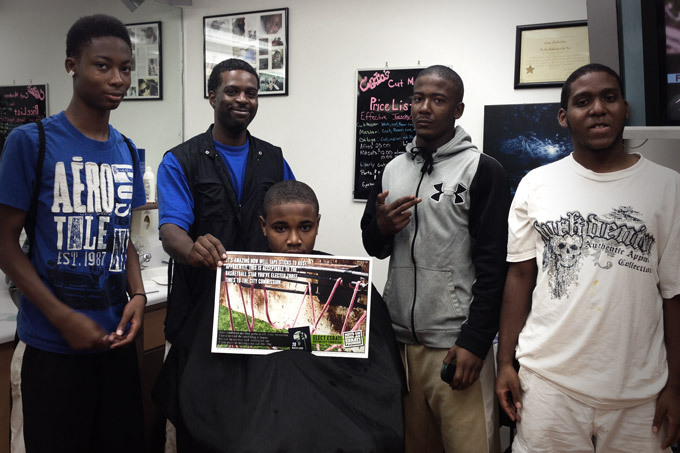 Cato Mayberry owns Cato’s Cut Masters at 2233 N. Gettysburg Ave, Dayton Oh 45417. Phone number is 937-274-3486. Tramale Forbes is just starting his career as a barber- in the city. This is a job that’s being created without the city handing out tax breaks. Tramale invited the crew to step into the picture- this is our future. The young man on the left had already seen green nets on rims and knew that I was doing something for the community that the current city commission isn’t. Thanks for sponsoring a court Tramale and thanks for getting your business started in Dayton- people will always need a hair cut (at least those of us who still have hair).